And the more I think about it, sure, the nearer I'm to cry. 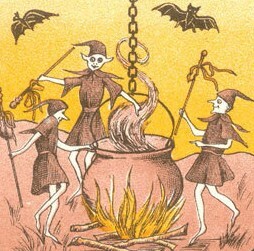 Many of our Halloween customs have their roots in ancient Irish traditions. The Celts celebrated Samhain which marked the end of the 'light days' of summer and the beginning of the 'dark days' of winter. They celebrated the end of the harvest and prepared for the cold months ahead. The custom of carving jack o'lanterns sprung from an old Irish tale about Stingy Jack who cheated the devil and carved a lantern out of a turnip lit with a coal from the fires of hell to light his way. People carved scary faces in turnips, potatoes and beets and placed them in their windows to keep wandering evil spirits away. Colcannon is a traditional Irish Halloween dinner of mashed potatoes and cabbage or kale. Unmarried women would place the first and last spoonfuls in their stockings and then placed them on their front door, supposedly the first man to enter their household was destined to become their husband. Coins are still wrapped in paper and hidden as treats in the buttery potatoes. Some households even leave a small bowl with a mound of butter for the fairies and ghosts. Colcannon was often cooked by the fireside in Bastable ovens, similar to our cast iron camp ovens. There are many recipes for Colcannon and like any popular dish passed down through generations, people's grandmothers and mothers probably made their favorite version of this hearty meal. Depending on what part of Ireland you are from, some swear it is made with cabbage and others kale. They all include potatoes, onions, leeks or scallions and a mountain of butter. Many recipes require cooking the cabbage and potatoes separately but to simplify the process I decided to cook all the vegetables together at the same time. I placed the diced potatoes in my 10 inch dutch oven, covered them with water then scattered the chopped scallions and cabbage over the top. I placed the oven over a full compliment of coals and covered the lid with a generous amount of coals, enough to bring the water to a steady boil. In 25 minutes, when the steam was pouring from the oven, the vegetables were tender and ready for mashing. I drained the water, placed the oven back on the bottom coals, then added the milk and butter. Light and fluffy, mashed together this peasant dish becomes positively elegant. Add the finishing touch by making a well in the center of the steaming mash and filling it with sweet, melted butter and don't forget to leave a small saucer for the wee folk. Place potatoes in bottom of oven, add just enough water to cover potatoes. Sprinkle cabbage and scallions over potatoes. Place dutch oven over a full compliment of coals. Cover and place as many coals on the lid as needed to keep the water at a steady simmer. Cook for 20-30 minutes or until potatoes are fork tender and cabbage is soft. Remove lid from oven. Using oven mitt tilt oven to drain water from vegetables. Return dutch oven to bottom coals. Add milk, softened butter, salt and pepper. Mash well with potato masher. Mound on platter, make a well in the top of potatoes and fill with melted butter.